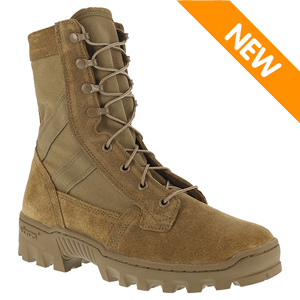 The Reebok CM8899 Men's Spearhead OCP ACU Coyote Brown Military Boot is a jungle boot designed with today's modern features and materials to meet the needs of the 21st century. This boot features hot weather construction with an unlined upper made of top quality 100% cowhide suede and abrasion-resistant nylon Cordura. It features 2 instep drain vents just like the original Vietnam era jungle boot for aeration and quick drying after traversing streams or rivers. This boot was designed for the Army's new OCP ACU and is AR-670-1 compliant and proudly made in the USA.